Mystery churches 1 - The remaining Puzzlers plus a New Selection!! Over the years I have gathered together old postcards or photos/cuttings of churches that I have not been able to identify and for seven years this page has been online and well over half have been solved - so mysteries no longer! Time at last to adapt these three pages into a mix of old and new puzzles. I believe that most are in the UK, probably England (unless mentioned), although with Victorian churches this is not certain. I would be grateful if any reader could offer suggestions, together with how certain they are (range 5% = not at all sure, to 100% = this is fact, don't question me!). Any clues that I have already are posted with the picture, and if identifed I will try and include these in any updates. For the other two pages of pictures click the links at the foot of the page. Solved one or have a suggestion? - E-mail me! This church is dedicated to St Barnabas (I assume the spelling on the card is a misprint!). 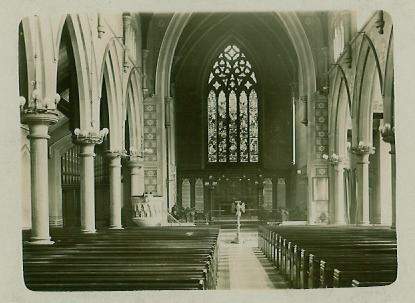 It looks a British church of the late C19 or early C20, but where? Philip Denton, an old friend of this site reports "Photo 1 is definitely St. Barnabas, Walthamstow, London E17. I was fairly sure at first glance, and this evening while in the area I drove past it just to make sure. It is by W.D. Caroe, 1902. 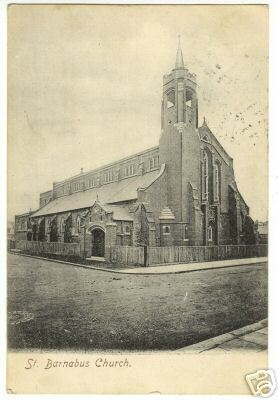 Like the nearby St. Saviour's, pictured on one of your previous cards, it is very much in the Anglo-Catholic tradition. 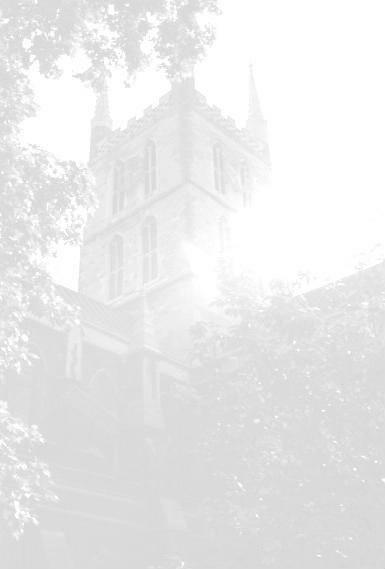 St. Barnabas' is actually much more impressive inside than the exterior might suggest." 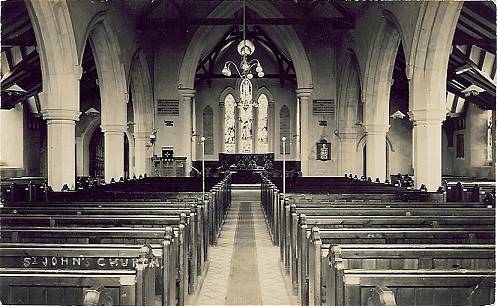 This "St John's Church" could be anywhere in the english-speaking world, a mid-Victorian interior. Quite a large church, the roofs in the aisles suggesting that the windows here have external gables. I would guess that this too is a British church. 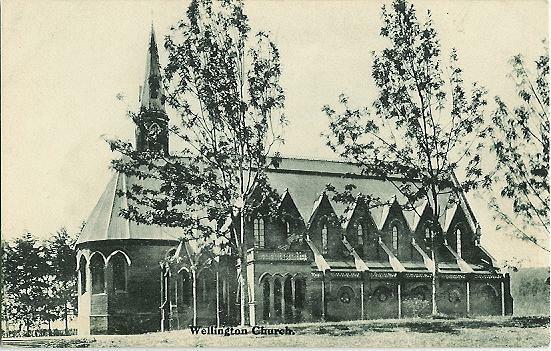 This church is clearly marked "Wellington Church" but which Wellington? The trees do not look English and a friend has suggested this could be New Zealand - however Wellington there is a huge city. For all my research, it was solved by dogged work by a father and son in New Zealand but there it was not. It is in fact in India. Christopher Challoner and in particular his son Jonathan, sent me this link to a picture from a similar angle, of St George's Chapel, Defence Service Staff College, Wellington, Ooty, which is near Coonoor. Clicking the left button steps down through a whole series of pictures of the chapel. Many thanks Messrs Challoner! The sign in front of the church reads "Primitive Methodist Church, Highfield Road"
SEPT 11th 2000 - John Oyston reports that there was a Highfield Methodist church in Wortley, Leeds. JAN 29th 2006 - David Miller informs me of a Highfield Road Methodist Church in Doncaster. My own research has came up with a Highfield Road PMC in Church Gresley, Derbyshire. DEC 5th 2006 Lynne states in a personal Email This church is Highfield Road Methodist church in Doncaster Yorkshire. I was a member there as a child. I went to sunday school and girls brigade. It was sold to a greetings card company or something like that, then was later knocked down and new houses built on the land. 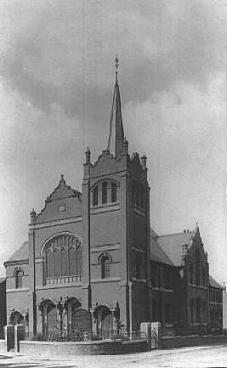 SEPT 20th 2012 Brian Wilkinson writes I can confirm that Mystery Church 5 is indeed Highfield Road Methodist Church, Doncaster opened in 1906. I and my family worshipped there from 1949 until it closed in 1965 I think it was. The congregation merged with that at Beckett Road Methodist Church to form St. Andrews Methodist Church which is still open. There are another two more pages of Pictures, have you seen them yet?